Bill Higgins, owner of Saratoga Garlic, holds a handful of leftover garlic stalks outside their barn in Northumberland, Nov 8. 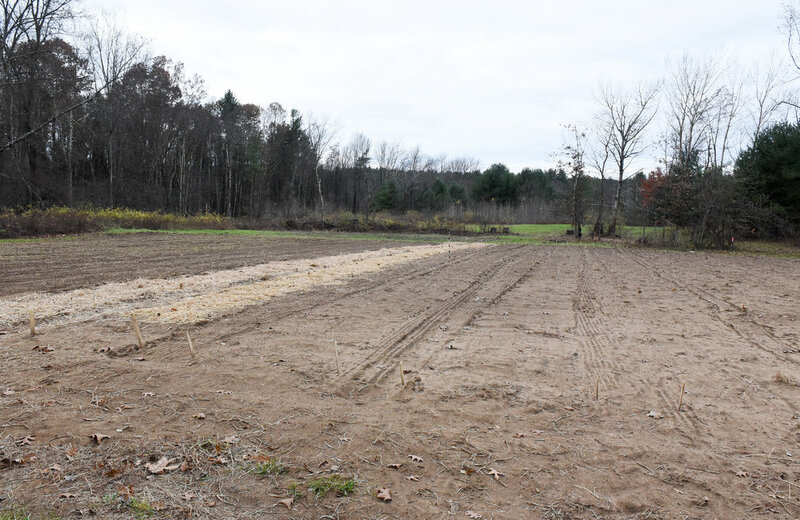 Saratoga Garlic’s workshop is thousands of miles from the North Pole, on a dead-end country road in Northumberland, eight miles from downtown Saratoga Springs. But like Santa, Bill Higgins and his helpers are crazy busy during the holiday season, shipping Saratoga Garlic products out into the world from Homestead View Farm. For 24 years, Higgins has been growing organic garlic on his 10 acres and mixing up aioli, a silky-smooth garlicky mayonnaise that’s prized by restaurant chefs and creative home cooks. If you visit Higgin’s farm, you’ll discover that the entire operation, from aioli making to the packing of holiday gifts, happens in a small room in a 1790s farmhouse that’s close to the field where the garlic is planted and the barn where the harvested bulbs are hung to dry. In one month, Higgins and a few workers can roll out 140 cases – that’s 1,680 jars --- of product. A mom from Rhinebeck recently sent a holiday garlic gift to her son the soldier. He is stationed in Germany and be headed for Afghanistan soon. In our area, you can buy Saratoga Garlic products at Hannaford markets, Roma Foods in Latham and Saratoga Springs, Sorrentino’s in Halfmoon and South Glens Falls, Fiorello Importing & Luigi’s Deli in Albany and Byron’s Market in Schuylerville. “Brook Tavern uses it on their burgers,” says Higgins. Since the 1990s, his fresh garlic bulbs and aioli have appeared in New York City at the Manhattan Fruit Exchange in Chelsea. And this year, Saratoga Garlic products began popping up in farmers markets and shops in North Carolina. Bill’s son, Max Higgins, who lives in Raleigh, is helping with that venture. “We buy commercially grown organic garlic down there,” says the older Higgins, and the aioli is prepared in commercial kitchens in North Carolina. Back in Northumberland, garlic is planted in late October, unlike most crops. Planting the individual cloves, which are saved from the current crop of bulbs, is back-breaking work. “A tractor puts holes in the ground and then we plant by hand. Optimistically, we’ll yield between 8,000 and 10,000 pounds,” he says. Higgins, who has a biology degree from Cornell University and worked at Saratoga Race Course as the barn foreman for Hall of Fame trainer Allen Jerkens, tested 15 different varieties of garlic over the years before settling on a German hard neck variety. Mulched with straw, the cloves rest in the soil until early spring. “It’s the first thing out of the ground in April,” he says. In June, the long green flower buds of the plant, called “scapes,” are cut and sold at farmers markets and to local restaurants. By mid-July, the garlic is ready to be harvested. “The tractor loosens the dirt and then we pick it up by hand,” Higgins says. From the field, it’s off to the barn, where the garlic hangs for 30 days. When it’s time to make the aioli, Higgins flips through his binder of recipes, some of which were bought from a chef and others that were developed by the Culinary Institute of America in Hyde Park. 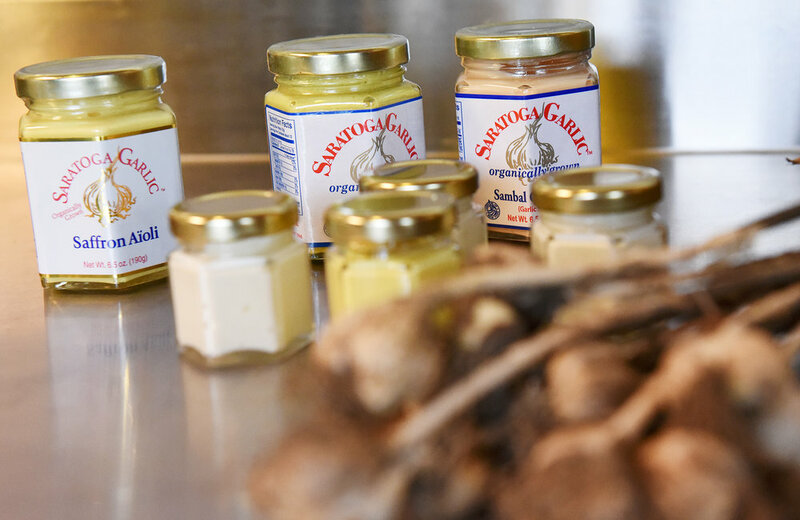 Saratoga Garlic aioli is an excellent topping for meat, seafood and vegetables, Higgins says. The curry aioli, which is more popular in Manhattan than around here, is a tasty sauce for a bowl of rice and veggies, he says. His roast beef sandwiches always get a smear of the Sambal Chili Aioli. For more info and recipes, visit www.saratogagarlic.com or Facebook.